On a certain occasion when bishop Anders Nygren was doing a series of lectures at the University of Chicago, he made a statement which evokes reflection. He said that when we seek to understand a certain phenomenon in history, we ought to ask two questions about it. 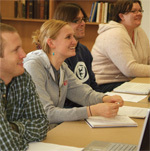 The first one, of course, is, “What does it mean by happening?,” and the second is, “What’s the significance of the fact that it happened when it did?” These questions can be raised concerning an event which has taken place specifically in theological education, but also more diffusely within the whole Christian community. That is the rise of interest in what has come to be called spirituality.